MS Outlook is widening its scope of communication by inculcating the new features in the technology with its inbuilt file formats i.e. ; OST and PST. The roles of PST and OST are well known to the users who often makes use of MS Outlook for communication. Due to such feature of MS Outlook, nowadays, more professionals and IT organizations are willingly migrating and opting for MS Outlook. Although, a systemic platform, MS Outlook has certain limitations. The limitations are branched in a manner that sometimes the inbuilt repair tool finds difficult to deal with such issues. These issues are of different nature and may somehow coexist. Moreover, these issues can be cataloged in the dual form-Software analogy and Hardware analogy. These categories can be generalized as virus corruption, Exchange server issues, PST size issues, sudden system shutdown and unexpected corruption of PST files. Due to software or hardware issues, the MS Outlook data files gets corrupt leading to misleading window messages. Display of such error message is the sure sign of PST files corruption. This error message is not the upper limit; therefore, user must know that any message that blocks the path of the algorithm to access the PST file must be considered as potential threat that will continue to disrupt the Outlook data files unless treated. Why PST data files are targeted? The reason behind targeting PST files for corruption is not deliberate. The PST files, due to their, binary structure and architecture are more prone to corruption. The root directory of such files are disengaged leading to PST file corruption. Once files are corrupted, the accessibility to such files are completely denied, even initial commands are not accepted by the system. Scanpst.exe is the inbuilt utility that comes with MS Outlook to repair the corrupt PST files. Depending on the nature of corruption of PST files, inbuilt PST repair tool is implemented in action. After damaged files are selected for repair, the inbuilt repair tool scans the concerned files to find the type of error inculcated in it. Once the errors in PST files are known and fixed, user can save the recovered file. What happens when Inbuilt Repair Tool does not work? When such situation is met, then user must immediately turn for an assistance from third-party tool. Such assistance is mandatory as continuous effort to retrieve PST file content using Inbox Repair Tool may damage file contents or may mislead the user. Moreover, assistance from reliable tool makes sure recovery of PST files irrespective of their level of corruption. 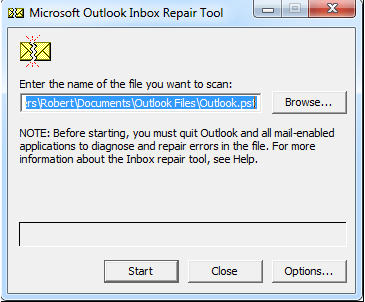 Recoveryfix for Outlook is the most referred third-party tool to fix the PST files irrespective of the degree of damage. The tool immaculately scans the selected PST files with different modes-Advanced mode and Standard mode. Even the selection of these modes is based on the degree of PST file corruption. The recovered PST file can be searched using search option. Data consistency and integrity is maintained while using this software. Recoveryfix for Outlook can be evaluated by installing trial version that works like licensed version but does not save results.